I used to donate to foodbanks now I rely on them. Had to finish work because of childcare costs. Universal credit at it’s worst. Dear readers I’m back! Thankfully I was able to attend this weeks demo. Last week was extremely busy but very productive. Before I start writing this weeks blog, please can I send get well wishes to Roy and extremely valuable member of the team. Get well soon!! If I said that today was busy that would be an understatement. From the minute that I arrived it was unbelievably busy, hampered slightly the weather but we’re used to it. If you can guarantee anything about Manchester and the surrounding areas it would be a given that it’ll rain sooner rather than later. Anyway enough about that. As I arrived a man was waiting for me. I call him a regular because he likes to stop and chat and keep me updated on his situation. He’s recently been rehoused and hopefully hes managing his tenancy ok. He’s a lovely chap but he finds life difficult. There just isnt the amount of support that he needs out there although local organisations do their best. The government have systematically starved outreach organisations of any funding and many of them have closed. Those that remain open do so by sheer determination and the goodwill of others. Not long after, I asked a young woman if she was ok and I handed her a leaflet. She told me that she regarded universal credit as being crap and after paying her rent and loans that she had taken out whilst she was waiting for her Universal Credit to be processed she’s not left with enough money for food. She’s now reliant upon food banks and the goodwill of friends. Her life won’t be getting better anytime soon. How can anyone productively look for work when they are hungry? They can’t. Hunger takes over everything, all of your senses and instincts are taken over by the need for food. Anyone that says otherwise obviously hasn’t been hungry like this. It was then when we ran out of food parcels. We handed six out, but a woman desperately needed food. Her situation is complicated and without food she could well find herself falling into a deep, dark spiral that’s hard to climb out of, so I took her to the shop next door to the Jobcentre and bought her some food. I asked another woman how she was coping on universal credit. She told me that she’s ok for one week of the month, but after paying her rent, universal credit loans and debts she can’t afford food. Shes disabled but has been placed in the work related group. The DWP have been very consistent with their hate for disabled people, and every week I find myself helping people with disabilities the most. The DWP cares not about disabilities only the potential amount of money that they can make out of a person. 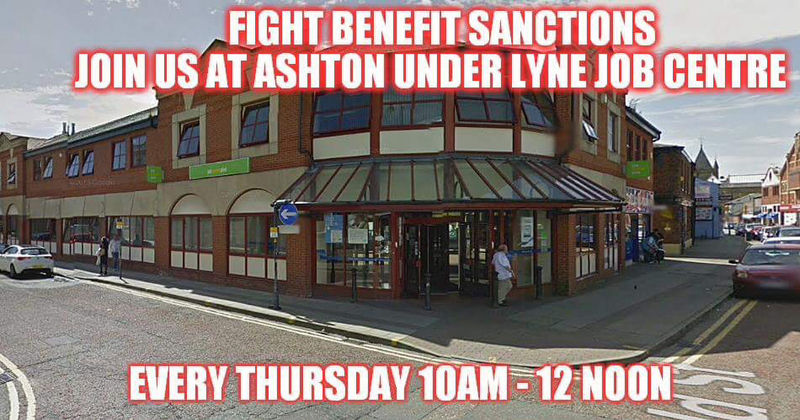 A young man then stopped me, took a leaflet and asked me what we were doing outside the Jobcentre. I explained that we were there to help people, to advise and signpost people if possible. He then opened up and told me his story. He had been claiming universal credit for a long while now, and was receiving the work related disability element. He had been asked to attend an appointment to transfer him over onto the new computer system. Unfortunately he became ill and was admitted to hospital. Because he was ill he had forgotten about the appointment, and anyway he was too sick to phone up. Of course the DWP showed their distinct lack of understanding about this, they stopped his claim and ignored his reason for non attendance. He even showed them details of his hospital admission. So he now he had to make a new claim, was now without an income, and the DWP didn’t give a stuff. As he was leaving an awful G4S security guard bellowed at him to go back inside the Jobcentre. Upon leaving the Jobcentre he was told that it’s now being sorted out. That’s brilliant however he’s had to go without money for a long while. It was then that I asked a young woman if she would like one of our leaflets. She told me straight away that universal credit is awful. Previously she had worked but because she has twins and two other children she was paying more money out in childcare than she was receiving so she had to end her job. Now she’s totally dependent upon universal credit and is paying back her universal Credit loan, buying gas and electric to keep her children warm and paying a top up on her rent. To say she’s struggling is a massive understatement. She’s dreading Christmas, hasn’t got a clue how she’ll manage, but she does know that her children won’t be having much of a Christmas this year. Reliant upon foodbanks to survive its a complete nightmare. I signposted her etc, and had a long chat with her. She told me that she used to always donate to food banks but now she’s reliant upon them. It’s a terrible indictment of how the government regards women and children. I then spoke to a young couple with a young child. Whom I shall name Bill and Mary. Here’s their situation. Both are on universal credit. Neither of them has a computer or the internet at home. Bill has Aspergers. They live separately after living together and have told the DWP that they no longer live together. The DWP are ignoring this. Mary’s letters from the DWP are constantly being sent to Bills house, and they are constantly being accused of co habiting, and have even been told that they should make a joint claim. Despite being a ridiculous thing to suggest, the reality is that they don’t live together therefore can’t make a joint claim. There’s two lots of rent to pay and a young child to look after, but the DWP reckon that its a good suggestion. They’ve also been complaining about the letters being sent to the wrong address for a long time now but nothing ever gets done about it. Why? Because the system is crap, not one department communicates with another. They just don’t. Can you imagine the implications of this if, say Mary’s partner was violent? Luckily he isn’t. If he was he would have details about her appointments, her finances etc etc. A woman’s safety is never a priority for the DWP, but this could result in something very serious happening to a woman. So it looks like because not one DWP department adequately communicates with another there’s little regard for data protection laws let alone potentially a woman’s safety. I then chatted to another woman with a young child. She told me that she’s having a nightmare with the DWP and universal credit at the moment. She works part time and relays upon childcare to go to work. Every month the DWP expect her to upload her bank statement etc so that they can pay her childcare. Every month the system won’t allow her to upload this information, so every month she has to go into the Jobcentre to try and sort it out. You’d think that a task like this should be easy to complete wouldn’t you, afterall they’re always banging on about how brilliant universal credit is, how it supposedly ‘lifts’ you out of poverty (it doesn’t) and how easy the computer system is to navigate (it isn’t either}. It’s one big nightmare for her and she has to rely upon friends to survive, although shes worried that they’ll no longer be able to help her in the future. It’s disgusting, degrading and humiliating. Anyone that believes that universal credit is a good thing and can be fixed needs a reality check. It’s got more holes than a fishing net and could they fix all the holes in one? It’s beyond repair and they need to wise up. I spoke to the elderly father of a young man. He’s been supporting his son for around twelve months now. His story is a bit complicated, and from what I could make out he hasn’t received any payments for twelve months but they wern’t sure why. I signposted them as a matter of urgency. They are struggling so much themselves and can’t afford to keep their son as well, but they also can’t leave him without. What a horrible situation to be in, it’s beyond cruel. 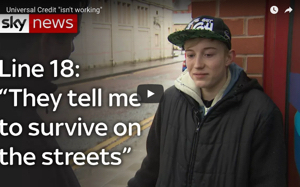 A young man then stopped me and old me immediately that Universal Credit is crap. I asked why and he told me that after claiming universal credit for a long while he now has to provide the DWP with all of his ID again. He wondered why he has to do this, they already have copies of everything and if they look they would easily find it. But no, that would be too easy wouldn’t it. So now, like many others he’s forced to start again and all because the DWP have created a system that fails to talk to the old one. Wonderful and they wonder why suicide rates are rocketing. In my living memory, the poor and disabled have never been persecuted as much as they have now, and this will get much worse next year. The system won’t be able to cope, but the DWP and government will blame the claimant not themselves and they don’t give a stuff either. A massive thanks to everyone that came along today, get well soon Roy and thank you to Pat for making us a new banner. Please read, share, email and tweet my blog. Many thanks to my readers that already do. Many thanks to everyone that supports my blog, thank you so much. I hate asking this but if you can, please donate to keep my blog going. I’m on an extremely low income and every penny helps! Thank you! Left without a penny thanks to Universal Credit and unhelpful DWP staff. First may I apologise for the lateness of the blog. I had to attend an important meeting in London where I was representing the victims of universal credit, and the damage and pain that universal credit causes. As you are already aware, universal credit creeps up upon people like a thief in the night, destroying every element of life as you knew it. Instead your future is often reliant on the network of foodbanks and the kindness of friends and family, thats if you have any of course. It’s impossible to fix and has more holes than a fishing net. As I know from experience poverty is very isolating and surviving becomes a priority, everything else seems to pale in comparison. Each and every person that myself and the team speak to are isolated in some way, and their struggles overtake their lifes. Before I write the account of yesterdays events, please may I stress that everyone received help, advice, a copy of our survival guide and a food parcel if needed. Five food parcels were handed out to hungry people. Also I need to thank every single member of the team that attended the demo in my absence. Roy has given me a brief outline of yesterday’s events and I’m thankful of that. The weather yesterday was terrible to put it mildly. It was extremely windy and the rain was bouncing down thanks to storm Diana, and it’s hard work standing outside for two hours in those conditions. Gordon dropped the food parcels off and so the morning started. Because the weather was awful people were dashing in and out of the Jobcentre, heads down wanting to get their appointments over with as soon as possible. As a result it was hard engaging people in conversation, and I apologise for the lack of material in this weeks blog. As usual, some people were waiting for the food parcels, albeit in different places desperate to find shelter. It’s abhorant that people need to use food banks in the first place and we all need to campaign in whatever way possible about the very need for them. Supermarkets set up boxes for people to donate food, and the poorest that have needed to use food banks themselves often donate the most. I argue that supermarkets should provide this food themselves, not the public. They can afford to do so, but hey my opinion means naff all in the world outside my blog and campaigning. Apparently he had made a claim for universal credit and was a chap about ten years older than myself. A man brought up in what seems like a different world, a world that cared for people, a world that had a good safety net that could be relied upon. Now the safety net has disappeared, gone, nowhere to be seen. He was advised to take a food parcel and signposted to various local organisations that might be able to help. Will he contact these groups? Who knows. He might feel ashamed that his life has come to this, a bag of food and some kind words by strangers. Universal credit, the benefit reforms and the governments so called austerity measures are responsible for the deaths of thousands, this we do know. People like this man are a high risk of becoming one of these deaths simply because there’s no real safety net at all, NHS services are cut to the very bone and trust in organisations such as Mind and Citizens Advice are low because of their involvement with the DWP. The DWP has now become the enemy of the people, something to be feared. The DWP buys off charities and organisations and even has supermarkets like Sainsbury’s spying on disabled people for them. Big brother is here in the form of the DWP. Disabled people and many unemployed people are becoming afraid to leave their houses for fear of abuse by the right wing types, discriminated against because they have a disability, discriminated against because they are poor. We know that this isn’t acceptable but to thousands it is. The tories have directed a hate campaign via the media and it worked, people have become even more isolated than before. Like my friend Paula said yesterday, we need the left wing, especially the Labour Party to change the language that they use, lets stop pitching workers against disabled and unemployed people please, because thats exactly what it feels like. Yesterday was tough, tough for many reasons and reality is tough. No amount of positive thinking can change this. We will be back next week, and I will certainly be there, so come and say hello. We do important work and people rely upon us. Know this, as you’re reading this, someone will be thinking of taking their own life because they can’t take any more persecution from the DWP. Know that a mother or father or both won’t be able to eat today because they can’t afford to do so, but they will feed their children. Know that a young person will be leaving care with little or no support, many becoming homeless. Know that an individual or family will be made homeless today and won’t have anywhere to turn, many having to sofa surf or live in rat infested temporary accommodation. I could go on for forever but you get the picture. People are dying and the government doesn’t care. Please read, share and email my blog. a massive thanks to those that have already, thank you! !